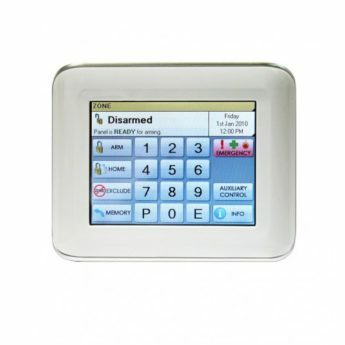 Ness D16X Panel with White LCD Keypad provides both the user and the installer with unrivaled ease of use. Its self-explanatory operation guides provide you with plain English displays and intuitive operation. Ness LCD Keypad makes it easy to view your entire system. Get prompts for arming/disarming, home automation features, emergency alarms and much more. The easiest to read alarm keypad ever ! Clean, crisp design adds elegance to any decor in the home or office. Add your own text description text descriptions for your alarm zones. Choose from the built-in library or add your own. Never lose a business card again ! Your installer can leave his contact details in your Navigator. Navigator makes everyday programming such changing user codes or timers a breeze. Navigator is a true Price-Performance breakthrough offering touch screen technology for not much more than a traditional keypad. Navigator is proudly a genuine Australian product – conceived, born and raised at our Seven Hills NSW manufacturing facility. MAXIMUM KEYPADS 3 x Navigator Touch Keypads max. INTEGRATED RADIO OPTIONS Multi-pin connector for the optional Ness Radio Interface. INTEGRATED ACCESS CONTROL Multi-pin connector the optional Weigand Interface.